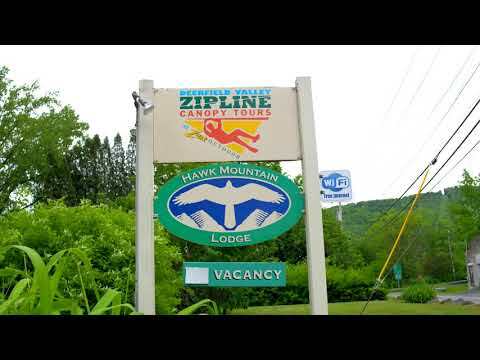 Zip Line Canopy Tour - Start your morning with a three-hour tour through the trees. The trip includes 11 zips, two sky bridges, and 3 rappels. Lunch - We provide a picnic style lunch prior to our rafting trip. Zoar Gap Rafting - This half-day rafting trip starts at 12:30 pm, and takes you down a a section of the Deerfield River through class II and III whitewater. For Rafting: Expect everything you bring on the raft to get wet! Best options for clothing: bathing suit and/or shorts in the warmer weather, longer pants and sweater made of wool, nylon, fleece, or polypropylene in the colder weather. Sneakers or other shoes that can get wet (no flip-flops or Crocs!) Cotton Clothing such as blue jeans, sweatshirts, or t-shirts, is not appropriate for rafting since cotton keeps you cold when it gets wet. All Guests will be required to wear a Zoar Outdoor issued PFD(Personal Flotation Device) and Helmet. To Zipline: Wear comfortable clothing appropriate for the season, but avoid loose clothing that could tangle in ropes or other gear. Skirts should be avoided. In late fall or winter months, it is better to come with too many articles of clothing than to come with not enough! We go in the rain, so come prepared with rain gear if needed. You should also remove any dangling jewelry and tie long hair back. Zip Line Canopy Tour- Start your morning at 9 am with a three-hour tour through the trees. Learn about the trees at each platform and view the forest with a new perspective. The trip includes 11 zips, two sky bridges, and 3 rappels. Once your zip gear is put away, a zip guide will instruct where to go for your picnic style lunch. We provide a picnic style lunch prior to our rafting trip, but you should plan on providing your own food for all the other meals. We do not use nuts in our food, but cannot guarantee that the ingredients in our meals do not contain nuts or other food allergens. If you have food allergies or other special dietary needs, we strongly suggest you bring your own bag lunch in non-glass containers and we will pack it with the other lunches on your trip. You're also welcome to call our office at 1-800-532-7483 with any questions about the menu. If you intend to bring your own meal, please let us know ahead of time. Zoar Gap Rafting - This half-day rafting trip starting at 12:30 pm, and takes you down a section of the Deerfield River through class II and III whitewater. You will have the chance to admire the beautiful landscape of the Berkshire Mountain range with chances to dip your toes in and swim. The trip wraps up around 4:30 pm. You'll have your afternoon and evening free to explore the local hiking trails or head out to see the surrounding towns. Since this is a day of two activities with us, it is best to park in our unpaved lot located at 7 Main St. in Charlemont, MA. Head up the stairs towards the red building. The main base for our zipline canopy tour is located two buildings down and is painted green. Any of our staff members will be happy to help you find your way around! Everyone will need to have a separate signed waiver for each activity on the day of the corresponding trip. Once you have signed up for the trip, check your confirmation email for a link to sign both Rafting and Zip Line waivers electronically. You can also download and print the waivers here.